The first time we traveled to the Galapagos Islands five years ago, I felt as wide-eyed and full of wonder as Jack Skellington when he discovered Christmas (What’s this? What’s THIS?!?! La la la la la la). Animals with no fear of humans? Four to five different species hanging out together peacefully on a five-foot square rock?! Sea lions that swim up to you when you’re snorkeling, enticing you to play?!? What IS this magical nature-lover’s utopia?!?!? Returning to the islands on an 8-day, 30-passenger small-ship cruise with International Expeditions a few weeks ago, I was no less impressed with the astounding natural beauty this remote Ecuadorian archipelago has to offer. But because I knew what to expect this time around, I found myself more focused on each memorable moment my daughter and I shared. The idea that Penguins live near the Equator makes no logical sense whatsoever. Scientists believe that the Antarctic ancestors of the world’s rarest penguin species wound up here after getting caught in the powerful Humboldt Current. 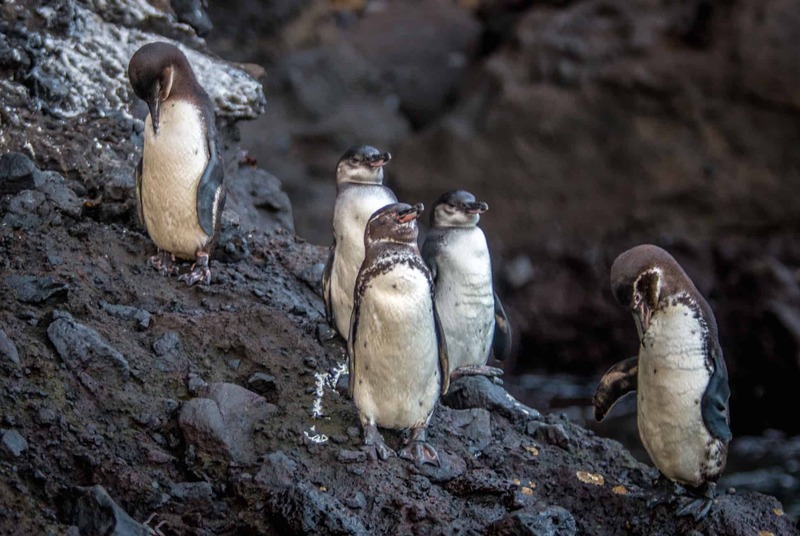 Over time, Galapagos Penguins genetically adapted to the heat (which ranges from 59º-82ºF) by getting smaller– they average 19 inches in height and weigh around 5 pounds. They cool themselves off by stretching out their flippers, hunching forward to protect their feet from sunburn and panting. When the heat becomes unbearable, they simply go for a swim. Just as “adapt or die” seems to be the order of things in the natural world, we as humans have to adjust to a world where technology, industry and society itself is changing at lightning speed. Too often we find ourselves complaining about the way things should be rather than addressing what is, and either adjusting to that reality or working to change it. In my life and career, adaptation and improvisation have proven the keys to long-term success. 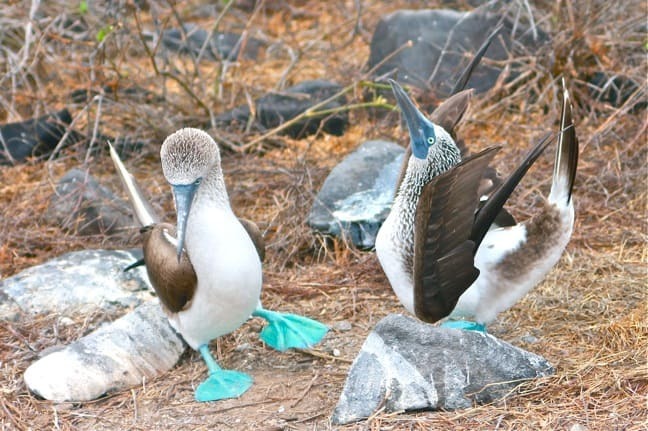 The Blue-Footed Booby is an unabashedly odd bird. They’re believed to be named after the Spanish word bobo, meaning “stupid,” because European colonists thought them clumsy and ungraceful on land. Their big blue feet are clownishly comical, particularly when males do their exaggerated stamping-style mating dance in an effort to entice the female. But those funny feet serve a serious purpose: Both parents use them to cover their babies and keep them warm. And while they may seem silly on land, Boobies are downright dazzling aerialists. It’s exhilarating to watch them fold their long wings back around their slender bodies and plunge into the water like torpedoes from as high as 80 feet to scoop up prey such as sardines. All too often we find ourselves criticized for anything that makes us stand out from the crowd. As a teen, I was ridiculed for my husky physique, while Mary was mocked for her curves. In shame, we tried to hide what we later realized were great assets. Wouldn’t it be better if we all chose to celebrate the qualities that make each of us different? Embrace your inner weirdo! By the mid-20th century the species was nearly extinct. On Baltra Island, introduced goats were eating the low-lying vegetation they needed to survive. On Isabela and Santa Cruz, entire populations were wiped out by feral dog packs, who ate young and adult iguanas alike. 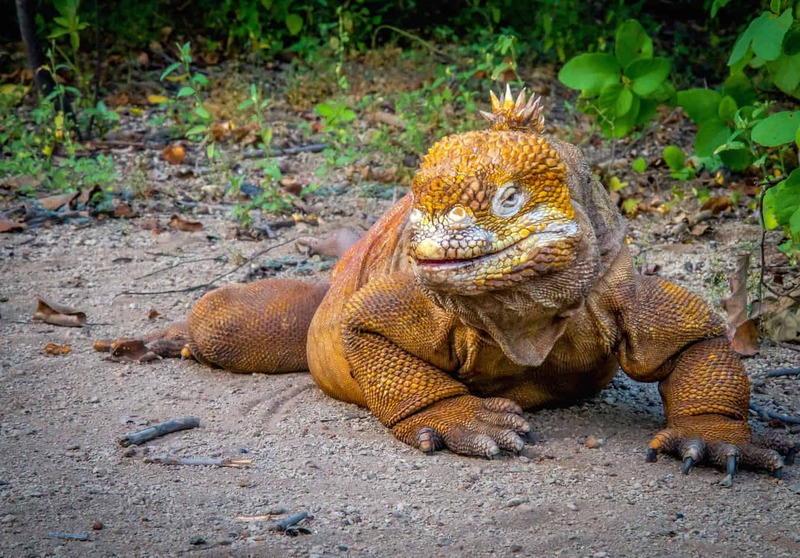 It took 50+ years to hunt and kill these invasive species and re-establish healthy Land Iguana populations in the islands. But in 2008 the breeding program was ended, and deemed a complete success. It takes a lot of wisdom and maturity to recognize the difference between vital parts of our personal ecosystem and those toxic presences who consistently take more than they give. Removing people or situations that bring negative energy to our lives is never easy, whether it’s a romantic partner, friend/family member or our place of work. But ultimately these tough decisions are crucial to our mental and emotional well-being, allowing us to thrive and flourish without feeling drained. As children, we don’t need to be reminded to play: All our needs are taken care of and there’s little cause for stress or worry. Playtime allows us to use our creativity and develop our imagination. Play is crucial to developing our physical, cognitive and emotional strength. But outside of competitive sports, adult playtime is seen as an immature, unproductive, guilty pleasure. Once we become adults, we’re supposed to be mature, responsible, focused on personal and professional growth. But psychology studies prove that play is equally important for our happiness as grown-ups, helping us with problem-solving, creativity and better emotional intimacy. 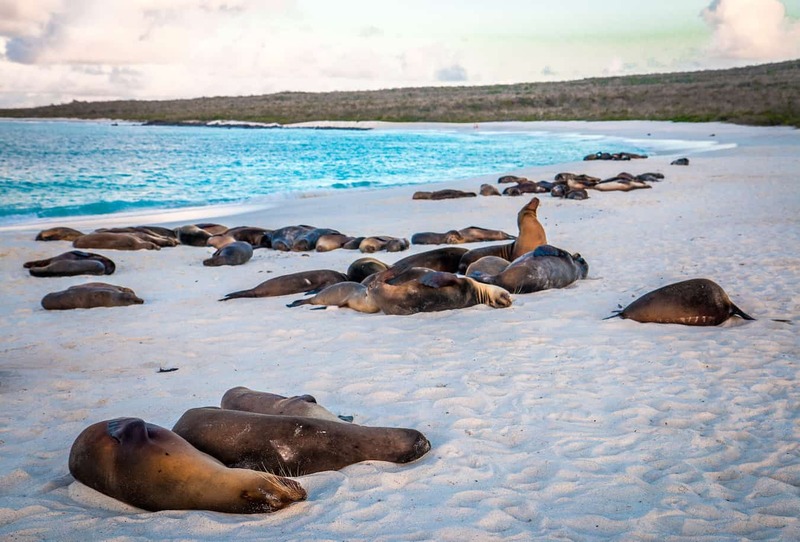 Galapagos Sea Lions are arguably the most playful animal species we’ve ever seen. They’re like overgrown puppies– insatiably curious, interactive to the point of insistence, and downright cuddly in groups. 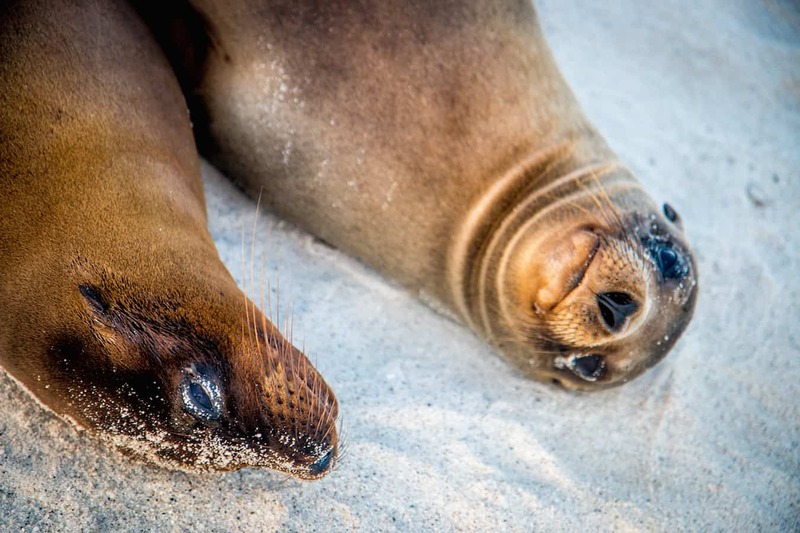 We had several sea lion pups come right over to us as we sat on the beach, while others enticed us to swim with them in spinning circles until we were dizzy and breathless from giggling. It’s impossible to feel stressed when you’ve got a face like the adorable one above smiling at you! 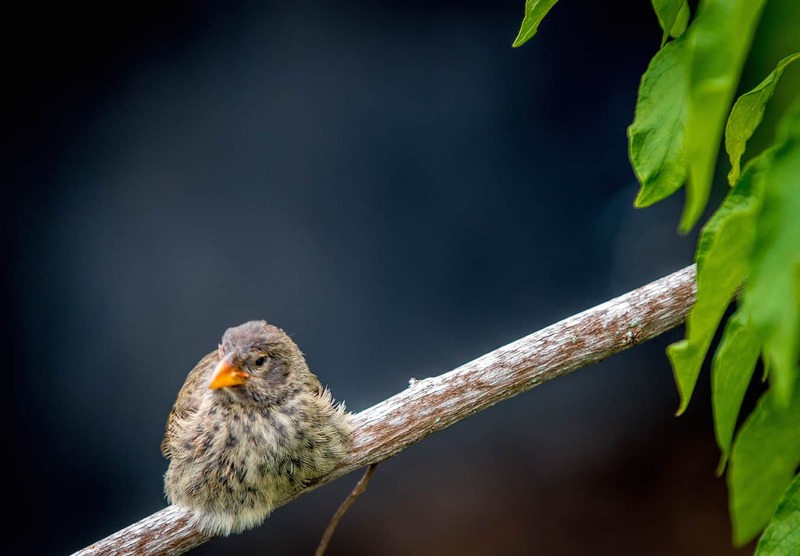 The 14 bird species collectively known as Darwin’s Finches don’t really seem like much at first glance. They’re not as colorful as the Blue-footed Boobies, as rare as the Galapagos Penguins, or as bizarre as the Flightless Cormorants. But these tiny birds have made a huge impact, both on the Galapagos Islands ecology and on mankind’s understanding of biology. Each species has a distinctive beak size and shape, and their feeding behavior is specialized. Some eat seeds. Some remove ticks from tortoises and land iguanas. Some use twigs or cactus spines to extract insect larvae from holes in dead tree branches. Together, they fill the roles of seven different families of birds found on mainland South America. Because of the competitive “keeping up with the Joneses” nature of modern life, we often compare ourselves to others and wind up feeling small and insignificant as a result. But every one of us has a specific role we’re meant to play, and it’s important to value our contributions on their own merit. Even if you’re not the smartest, richest, prettiest, skinniest or most successful person, you can still do the little things that help make the world a better place. Everyone knows the story of The Tortoise & the Hare and its central lesson: “Slow and steady wins the race.” But how many of us actually remember to incorporate this wisdom into our daily lives? I was reminded of Aesop’s Fable during a drive to Rancho Permiso, a privately-owned farm on Santa Cruz Island that serves as home to over 100 wild Galapagos Tortoises. 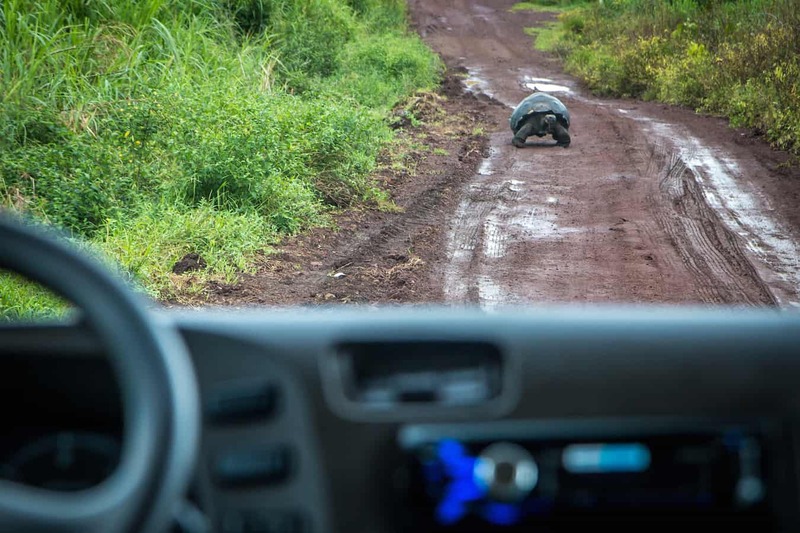 As our bus made its way down a long dirt road, we spotted a massive 300-pound tortoise slowly making its way towards us, giving no quarter. As we got out of the bus to take a closer look, he stopped, but didn’t veer from his path. As the bus carefully creeped off the side of the road to move around him, he tucked his head into his shell, but didn’t veer from his path. Once we passed, he continued on his way. One of my favorite inspirational quotes is from Michael Jordan: “Obstacles don’t have to stop you. If you run into a wall, don’t turn around and give up. Figure out how to climb it, go through it, or work around it.” True success is never easy. It takes a lot of hard work, dedication, patience and persistence. And sometimes it’s just about having the stubborn will to outlast the competition. Many of us are raised to believe independence is essential to happiness and success. But as important as it may be to establish a strong sense of self-reliance, there is also incredible value in developing the communication and compromise skills required to function as strong members of a community. 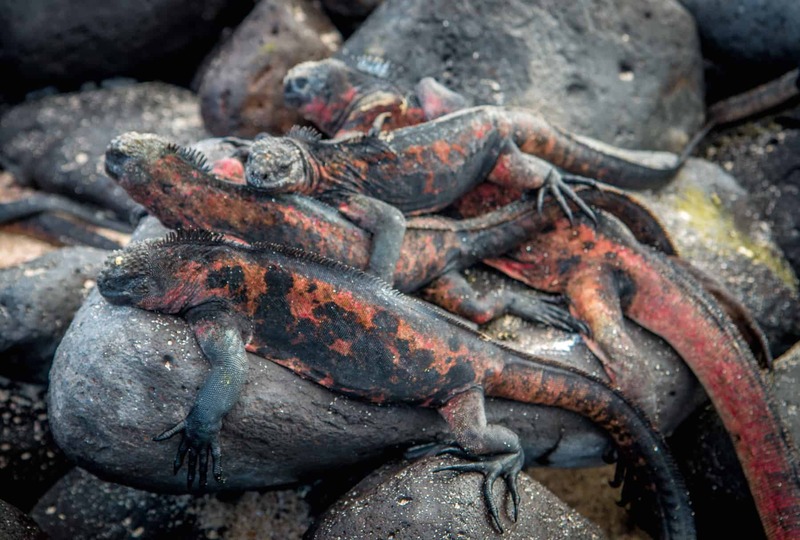 The Marine Iguanas of the Galapagos Islands understand the importance of the collective. These marvelously bizarre-looking miniature Godzillas swim out on their own to forage, diving up to 30 feet deep to feed on algae. But they can’t stay in the cool water long before returning to the lava-lined shore, cluttering en masse like kittens on the rocks to absorb heat from the sun. Together, they stay warm and make themselves difficult targets for predators such as the Galapagos Hawk. Together, they are stronger and better able to survive. Our trip to the Galapagos was sponsored by International Expeditions, but we will never compromise our obligation to our readers. Our opinions remain our own.